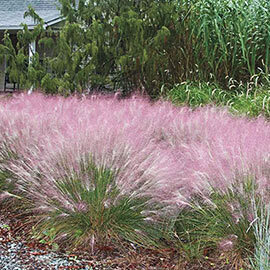 Pink Muhly Grass | Henry Field's Seed & Nursery Co.
Southern adapted, easy to grow! Its flower heads create a billowing-cloud effect beginning in mid to late August. This spectacular, yet softly subtle, grass announces that fall is coming to all areas of the South! Disease and pest resistant (including deer!) Mature height is 3' tall. A real eye-catcher! Potted. Zones 6–10. Height 18 inches (36 inches when in bloom). Height: 18 inches (36 inches when in bloom). 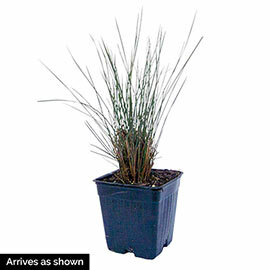 Foliage: Tidy clumps, fine blue-green foliage. Blooms: Late Summer to mid Fall for 6 - 8 weeks. Flower Form: Purplish-red inflorescence, diffuse silky panicles 18 inches high. Pruning: In late winter to early spring, cut back old foliage down to a few inches above the base of the plant for a neater appearance the rest of the season. Late winter to early spring.